Guide for use: 7 ml of paste is aspirated into a plastic syringe and is carefully transferred into the central circle of a half-hour blotter test card. The test card is placed on top of an upright plastic beaker, and after half an hour the distance (in mm) migrated by the serum of the paste is recorded along each of the four axes (North, South, East and West). 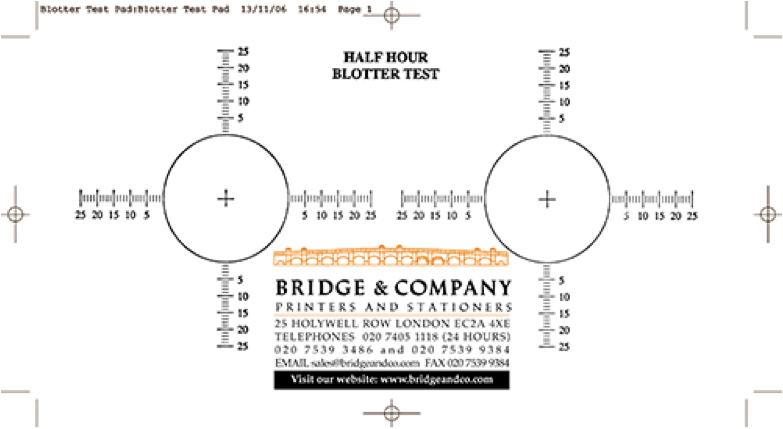 Two blotter tests are carried out for each sample, and the four values are averaged. The larger the blotter value, the greater the level of syneresis present in the sample. For overseas orders, we will fax or email you a pro-forma invoice to be paid through your bank. The cards will be sent immediately we receive payment.